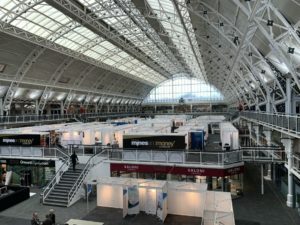 A delegation headed by, Mr. G.Nandinjargal, State Secretary of Mining and Heavy Industry of Mongolia attended the 16th Annual “Mines and Money” international mining event in London on 26-29 November. Ambassador of Mongolia to the United Kingdom H.E. 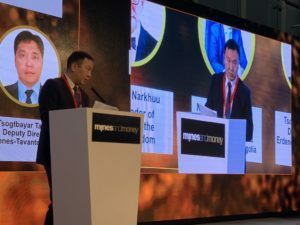 Mr. Tulga Narkhuu and State Secretary of Mining and Heavy Industry Mr. G.Nandinjargal made opening remarks at the session on “Mongolian showcase”, where Deputy CEO of “Erdenes Tavantolgoi” company Mr. Tsogtbayar made a presentation on the Tavantolgoi deposit and the “ETT” company’s IPO, introduced current progress of selling up to 30 percent of the total “ETT” shares on the international and domestic stock markets. 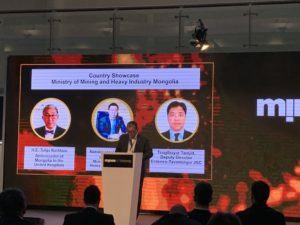 Also, “ETT” company opened a Mongolian pavilion at the “Mines and Money” exhibition, where the company was promoting the Mongolian mining sector, including projects and initiatives to the international investors. 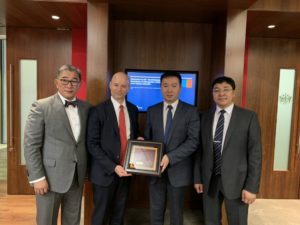 The Mongolian delegation also visited the London Stock Exchange Group and had a meeting with Mr. David Schwimmer, CEO of the LSEG. In this meeting, both sides exchanged views on “Tavantolgoi mine” project and the ETT company’s prospective IPO.